Dr. Yong Ho, supervisor of Chinese language programs for the United Nations, goes above and beyond for his students. As a finalist for a UN 21 Award, given once a year by the United Nations (UN) secretary general to outstanding UN employees, Ho didn't expect he had much of a winning chance. His category, Service Above the Call of Duty, had just two finalists: Ho, the head of Chinese language programs for the organization, and a war-hardened team operating out of a combat zone. The combat team, beaming in via a live satellite feed, was clearly favored to win. "It operates much like the [Academy Awards]. You only know the result when it is announced on the spot," Ho said. "In my category, the other candidate was a team either operating in Iraq or Afghanistan--some kind of very dangerous situation. I didn't have a chance. And then, I won! I was so surprised. They are out there in a dangerous place, and I just did what I've been already doing for 12 years." Ho's award-winning work does involve a level of sacrifice on his part however. For more than a decade, the professor has given up his summer vacations to organize Chinese language tours for groups of UN students. His dedication has attracted hundreds of UN staffers and delegates to begin Chinese studies and has ignited a wave of enthusiasm that includes the secretary-general himself. Learning languages at the UN looks a little like a university foreign languages department, Ho described. There are six official languages at the UN--French, English, Arabic, Chinese, Russian and Spanish--and the organization offers its staff the opportunity to study in classes divided into winter, spring and fall semesters. Nine terms make up a three-year course, and then there is the option for students to take specialized classes focused on specific subjects. Students who do well on the UN language proficiency exam at the end of their course can qualify for a salary increase, adding a little extra motivation for completing the course. Mandarin Chinese is ranked a Category 4 by the U.S. State Department for being among the most difficult of new languages to acquire for native English speakers. The State Department estimates it takes 2,200 hours of class time for a native English speaker to become proficient in Chinese, compared with just 600 hours of French lessons. "Tones are very difficult for people whose language does not have that feature," Ho said, "and characters are also very difficult...so people who come to study with us are very devoted." This year, Ho's introductory level course is full beyond capacity, with teachers scrambling to find extra chairs for interested students. While the UN treats every official language equally, the major powers tend to become competitive and countries like France, Russia and China view the popularity of their programs as a point of pride. The Chinese Government, through its Confucius Institute Headquarters (Hanban) dedicated to promoting Chinese language around the world, has been particularly supportive of the UN courses. The office has donated additional funds, teachers, classroom materials, multimedia equipment, and has helped to facilitate Ho's efforts to expand and modernize the program. "When [Ho] joined the UN in 2002, there were less than 70 students enrolled. Now, more than 200 students are registered and the numbers are growing," wrote Dmitriy Shoutov, one of Ho's pupils. "The faculty uses advanced multimedia technology including an advanced hi-tech teaching machine called Center of Chinese Culture Experience which was donated by Hanban in 2011." "My favorite class was calligraphy," Shoutov told Beijing Review , adding that learning ancient Chinese wisdom through the study of calligraphy can be beneficial for today's UN diplomats. "Our most interesting lesson is the one we received directly from Under Secretary General Wu Hongbo during his address during the UN celebration of Chinese Language Day on April 20, 2013. He referred to the Chinese word 'crisis' (weiji ) that is a combination of two events: 'danger' (wei ) and 'opportunity' (ji )." Shoutov's classmates include Catherina, a tour guide at the Visitors' Center who wants to better communicate with Chinese visitors; and Pablo, a security officer who likes to "direct tourists in their native language rather than resorting to awkward gestures." At the other end of the spectrum, Ho said his students have included both the Vietnamese and the South Korean ambassadors to the UN. Secretary General Ban Ki-moon takes private Chinese calligraphy courses himself from one of Ho's teachers and often makes his works gifts to foreign leaders. He famously presented a calligraphy work to U.S. President Barack Obama on the American leader's 54th birthday in August. Written on the scroll was a quote from Tao Te Ching , which translates to "The highest virtue is like water." Ho's pet project has been organizing three-week educational tours for his students to his hometown of Nanjing in east China's Jiangsu Province. Students spend their mornings taking classes and applying their skills by exploring the city. Hanban has been instrumental in supporting the program since its beginning in 2004, Ho said. Students pay their own airfare, and the Hanban provides teachers and housing through Nanjing University. The program has attracted interest from Nanjing University students, with more applying to serve as host volunteers each year. "You really have to be in China to learn the language," Ho said. "They say the second year of study should be in-country, you cannot study the language remotely." A three-week immersive tour is the "next best thing" for students who have full-time jobs and lives in other countries. The three-week Nanjing tour is equivalent to a "semester and a half" of class time, Ho said. Students have the opportunity to take extra classes in Tai Chi and calligraphy, and the program organizes tours of historical sites and weekend trips to Xi'an, Beijing, Shanghai, Suzhou or Hangzhou. "Each week the university arranges a city tour. There are a lot of historical relics in Nanjing due to its history as a capital for six to 10 dynasties," Ho added. "On the weekend, we usually take an out-of-town tour." At the end of the program, a longer optional tour is offered to remote destinations like the northern city of Harbin, Wuhan and Xiamen. 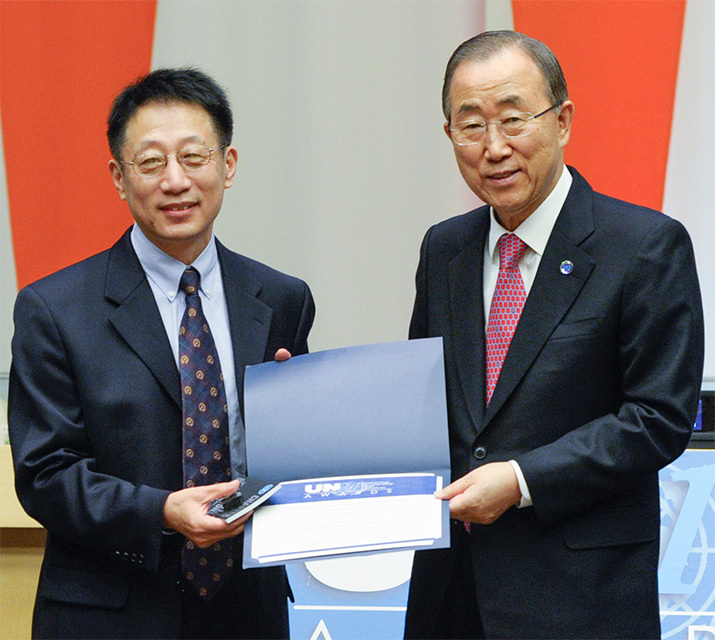 Since Ho uses his own vacation time to organize the tours, the summer trips have truly become a labor of love, earning him the UN 21 Award from the secretary-general for going above the call of duty. "It's not in my job description," Ho explained. "It was my own creation. I do it because--if you want to put it in a grand way--to promote Chinese study. If I take people to China and they enjoy it, it will be a boost to the program." Students who complete the program return "excited" about learning the difficult language of Chinese, Ho remarked. It helps to reduce drop-out rates. Ho said he also retains students by emphasizing the process of learning language, rather than outcomes. "The process is more important. You learn Chinese culture, Chinese philosophy and Chinese thought by studying language. That influences my student quite a lot," he said. The language tours also helps Ho's students gain a firsthand knowledge of China that challenged their preconceptions. "To a large extent, people in the West know much less about China than Chinese people know about the West. So this was a real eye-opening experience for many students," Ho commented. "In many cases it dramatically changed their view of China from what they read in the media. I think this personal experience is quite important." Some students attend the tours year after year, including one who has been on the trip a total of 11 times. She is now recognized on the street in Nanjing, and has been invited to local homes for dinner. "Language learning is a great way to bridge cultures. It's not political. There's no propaganda. You meet people, real people. Our students go out to the street corner in the morning to buy breakfast from the food stands and start up a conversation. They talk to a variety of common people. So they get a firsthand view and information. It's much different than talking to a diplomat," Ho said. "You're not just a listener, you're a participant." At the time of writing, Chinese President Xi Jinping was arriving for a state visit to the United States, with plans for him to address the UN General assembly. His speech will bring international diplomacy back into the conversation for Ho's students. It's an opportunity for the students to practice their blossoming language skills. "The UN Chinese language students have been eagerly awaiting President Xi's address to the World Forum. Their hope is to see new advancements toward global harmony and prosperity for all, and being able to translate President Xi's speech into their native languages without Google's help," Shoutov said.